The trio recently released an acclaimed album called Planktonic Finales on Intakt. When they perform they blend their various timbres so beautifully that the music feels totally cohesive. The result is captivating for audiences. Originally from Germany, Ingrid Laubrock resides in Brooklyn. Between 1989 and 2009 she was active as a saxophonist and composer in London/UK. Ingrid's main projects as a leader are Anti-House, Sleepthief, Ingrid Laubrock Septet and Ubatuba. She is a member of Anthony Braxton's Falling River Music Quartet, Nonet and 12+1tet, Tom Rainey Trio and Obbligato, Mary Halvorson Septet, Kris’ Davis Quintet, Nate Wooley’s Battle Pieces and Luc Ex’ Assemblée. Pianist Cory Smythe works actively in new, classical, and improvised music. He has performed widely, making appearances as soloist and chamber musician at the Darmstadt International Festival for New Music, the Bang on a Can Marathon in New York City, the Green Mill jazz club in Chicago, and the Mostly Mozart festival at Lincoln Center. In recent seasons, Smythe has played alongside violinist Hilary Hahn in concerts throughout the United States, Europe, and Asia. Their Grammy-winning album, In 27 Pieces: the Hilary Hahn Encores, documents Hahn’s diverse collection of newly commissioned encores for violin and piano. Two-day event! Tickets selling fast -- reserve your place now! The hot sounds of Cuba's roots and modern jazz come alive in the explosive hands of pianist and six-time Latin Grammy nominee Chuchito Valdes. Son of Chucho Valdes, grandson of Bebo Valdes, Cuba's most beloved musical dynasty. Following in the footsteps of his famed father and grandfather, Chuchito continues the legacy of great piano players form Cuba. Chuchito has recorded and performed piano with the world renown Cuban band, Irakere, which he led for two years. He has also performed at festivals, clubs and concerts throughout the world: from Cuba and the Caribbean to North America, South America, and Europe. Praised in the Baltimore Sun for her “impressive voice”, Maryland native soprano Laura Whittenberger was also named one of Baltimore’s Must-See Musicians by Baltimore Style magazine. Laura sings in concert, opera and musical theater performances across the country. This season, Laura has performed in the MD/DC area in Signature Theatre’s A Little Night Music and Annapolis Shakespeare Company’s Kiss Me, Kate. She also recorded a sequel to a new album of Yeats-inspired Irish folk/art songs by R. Driver, Songs that Sing in the Night, that will be available on iTunes this fall. Upcoming concert solos include Beethoven’s 9th Symphony in NYC in December. Laura enjoys art song repertoire, and has performed as a duo with harpist Jacqueline Pollauf for French art song recitals and other concerts over the past couple of years, and together last year they were winners in the Montpelier Arts Society Recital Competition. Laura holds degrees in vocal performance from Peabody Conservatory and Indiana University. For more info, reviews and updates, please visit www.laurawhittenberger.com. Harpist Jacqueline Pollauf has been praised for playing with “transcendent ability” (The Sybaritic Singer), “glittering beauty” (Lawrence Budman, critic for the Miami Herlad), and “most satisfying elegance” (The Toledo Blade). 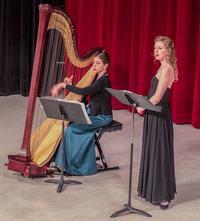 Past performances include the premiere of a new work for harp and voice at Carnegie Hall in 2016; and appearances at the Eleventh World Harp Congress in Vancouver, Canada; the Library of Congress and the National Gallery of Art, both in Washington D.C. Jacqueline has been a featured soloist with the Mid-Atlantic Symphony Orchestra, the Newark Symphony Orchestra, and the Salisbury Symphony Orchestra, among others. For this Baltimore debut concert, Miki will play standards and some originals from her upcoming recording on Cellar Live Records. Miki Yamanaka is a New York-based pianist from Kobe, Japan. She moved to New York City in 2012 and has studied Piano with Jason Lindner, Jeb Patton, and Fred Hersch, and Organ with Sam Yahel and Larry Goldings. In 2015 she was one of three pianists selected to participate in “Betty Carter’s Jazz Ahead”, an intensive composition residency at the Kennedy Center. She recently earned her Master of Music degree from Queens College, receiving the Sir Roland Hanna Award. Miki is known as one of the busiest pianists of her generation. She has appeared in concert with many notable musicians including Steve Nelson, Seamus Blake, Jerry Dodgion, Victor Lewis, Rich Perry, Antonio Hart and Peter Bernstein. She holds weekly residencies at Smalls and Mezzrow Jazz Clubs in NYC, and hosted a week-long tribute to Horace Silver in 2016, and presented her own music in 2017 at Dizzy’s Club Coca Cola. 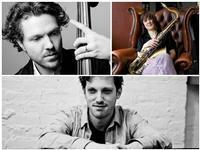 She is the current pianist in the Philip Harper Quintet, and the Roxy Coss Quintet. Miki recorded a mini album called "Songs Without Lyrics" in 2012. She recorded a brand new album with Steve Nelson, Orlando le Fleming, and Bill Stewart in 2017, which will be released by a Canadian label, "Cellar Live," in 2018. Artists present their own songs in the round, with your singing host, Geoffrey Himes. Jacob Panic is a singer-songwriter and banjo artist from Maryland. After receiving a scholarship in 2013 to study with the great Pete Wernick (a.k.a. Dr. Banjo) of the group Hot Rize, Panic returned with an earnest desire to make the banjo his primary instrument and the focal point of his performances, which he has been doing for years in the Mid-Atlantic region. His latest record was produced and recorded in Nashville by Grammy-Award-winning producer, Randy Kohrs. It features some of the region's best pickers and players including Kenny Aronoff and members of Mountain Heart. Panic's pop-folk vibe solely using a native bluegrass instrument distinguishes him as a rarity in modern music. He calls his genre: "pop-grass." Seth Kibel has won an astounding 28 Washington Area Music Awards (Wammies), including “Best World Music Instrumentalist” (2003-11) and “Best Jazz Instrumentalist” (2005, 2007-8, 2011-14). Though he is best known as a saxophonist and clarinetist, he has emerged in recent years as formidable singer-songwriter as well. His most recent recording, “Seth Kibel Presents Songs of Snark & Despair,” was released in 2017 on the Azalea City Recordings record label. With a progressive outlook, and an unhealthy dose of dark humor, the songs on this album traverse a wide landscape of musical genres, including blues, swing, klezmer, bossa nova, reggae, and more, and feature a variety of all-star guest vocalists. 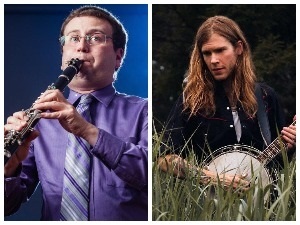 "New Waltz," a song from Seth's 2015 album, “No Words,” was the Grand Prize winner of 2016 Mid-Atlantic Song Contest (MASC), sponsored by the Songwriters' Association of Washington (SAW)..
Willem Elsevier is a conservatory trained violinist who has found success in both the classical and jazz worlds. He is best known, however, for his role in Love Riot, the Baltimore rock band that recorded with producer Eric Ambel and toured widely. Elsevier’s sophisticated solos helped the band beat out 2,500 other bands from around the globe to win the Yamaha Music Quest competition in Japan in 1994. Elsevier has also recorded with such acts as Billy Kemp and Milkshake. Since 2012, he has been performing and songwriter in a duo with Geoffrey Himes.